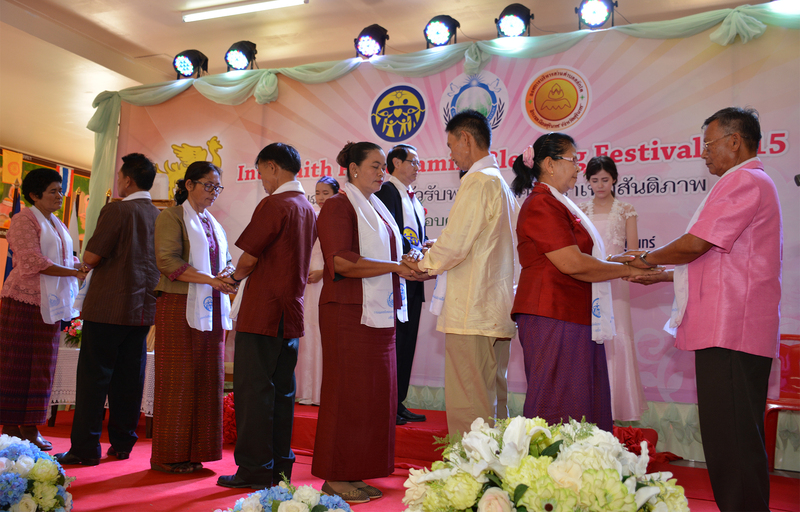 FFWPU Thailand: Interfaith Peace Blessing Festival in Salakdai Subdistrict, Surin County, Surin Province in the northeast of Thailand on May 31st 2015 in Chaiprakom Buddhist temple. There were around 250 couples join. Mr.Wancha Sonchaisakul, elder blessed family of 6,000 couples is the head of this tribal group. Tribal Messiah movement and Blessing in Surin County receive strong support from the ownership of New Blessed Families who had received blessing in Surin City during June 2014. The group of former school principal and community leaders got so much inspiration, then they receive higher education in Divine Principle and complete 3 days ceremony. After that they really determine to hold blessing in more grass root level in Salakdai subdistrict in Surin County. This blessing was held in the temple as the center of community. It was very successful and receive support from Provincial Arm Force Commander in Chief of Surin to give Opening Address. Blessing in Surin Province will continue to take root and expand greatly in the future.